No projects currently in progress. For information on a recent project, see below. For news on forthcoming projects please see news page. 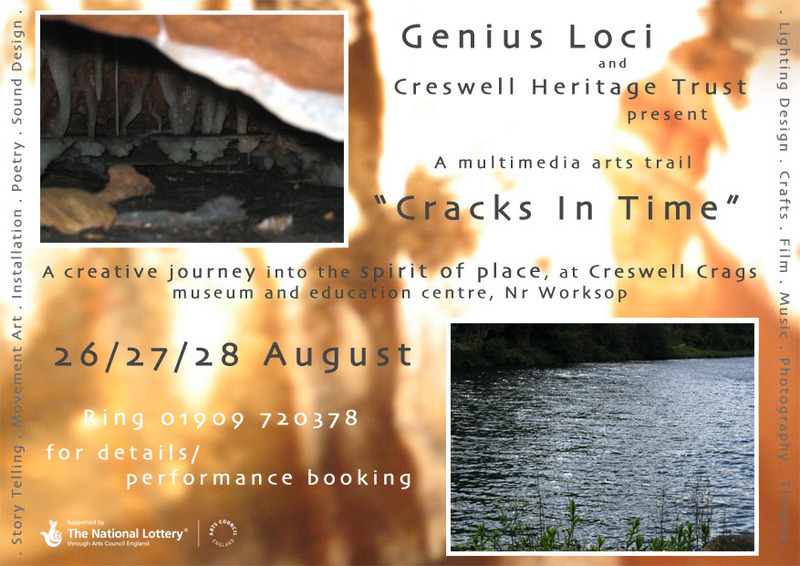 Genius Loci's present project is based at Creswell Crags, on the North Derbyshire/Nottinghamshire border, between Chesterfield and Worksop in the English midlands. This is a scheduled ancient monument and a site of special scientific interest, with a history of creativity going back at least 12,500 years in its newly rediscovered cave art. 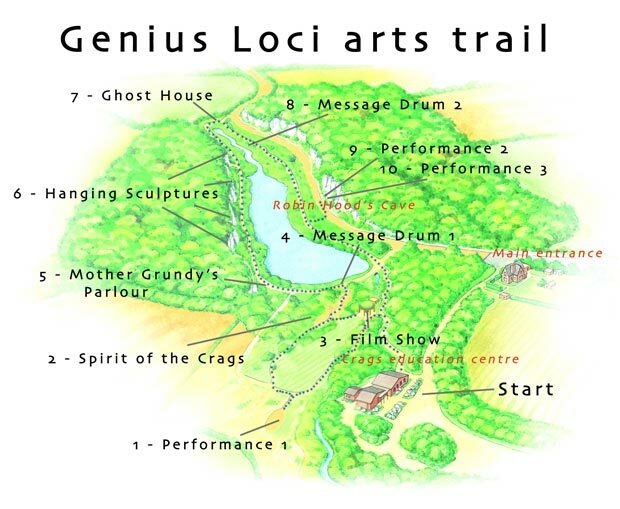 In April 2006, with the encouragement of the Creswell Heritage Trust, and funding from the Arts Council, we began visiting this site and letting the creative juices flow. Through the next three months, with the help of the staff at the Museum and Education Centre, we were privileged to visit and make creative experiments with sound, movement, photography and spoken word, in some of the innermost chambers of the caves in the side of the gorge, as well as design items for other parts of the site. About the geology and formation of the gorge and the passage of Ice Ages; the coming of our modern human ancestors and the disappearance of the Neanderthal people; the many metres of layers of archaeology uncovered by various generations of archaeologists with very different levels of sensitivity; the present delicate balance between preservation and tourism, and the disenfranchisement of the local ex-mining communities. Many ideas were put forward, (some more feasible than others,) much imagination and creativity was shared, and valued time spent with the staff led to a commonly felt deeper affection for the site. Our public event over the weekend of 26th, 27th and 28th August 2006 had all the choicest fruits of our work on display as a trail of experiences, performances and installations, looking through the Cracks in Time into what we felt to be the Spirit of Place, or Genius Loci, of the Crags. It felt good to display our work alongside that of our ancestors and we hope that they approved. See www.creswell-crags.org.uk for directions, and for more details about the Crags, the cave art and the excellent work being done by the Heritage Trust.